See also Personal reflections about adult life. Like in the BBC1 series, writer Katy Brent has a young son with autism but that is where the similarities end. When she received her diagnosis her mother Sam thought the doctors were describing an extraordinary child rather than someone with a disability. While not without the difficulties associated with autism, Saffron’s extraordinary, colourful imagination, articulacy and sensitivity certainly bear out that impression. Some parents of disabled children can appear unwaveringly positive. But one mother says her children’s autism has left her with “dark thoughts” and she wishes their impairments would disappear. Christine, not her real name, loves and is proud of her children, but she says she cannot abide the pressure she feels to be “relentlessly positive” about their condition because of the restrictions it puts on all of them. 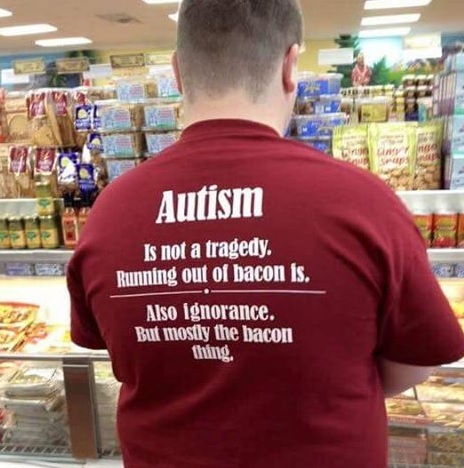 Michael … says the “autism pride movement” can be problematic for those who don’t assign to it – and there are also those with autism who take pride in their difference, which is “perfectly legitimate in many ways”. For more contrasting opinions see Mind the gap. Schoolgirls with autism share their thoughts on the question. See article. The article introduces their novel and also shares a discussion about girls on the spectrum. My husband and I have two autistic sons, 18-year-old identical twins Nathan and Curtis. Taking them out and about is a big challenge. Both boys have severe learning difficulties and are non-verbal. It is important that they get out without us. They have to pay for things and thank people, and practise using Makaton sign language. All this is fun but it is also essential for their day-to-day life as they get older. An uncle interviews his nephew, Sean, who has been diagnosed with Atypical Autism. In the 5½ minute video, Sean explains his understanding and experience of autism. A ten year old boy with autism wrote a poem. His mum shared her experience of reading it. Siara, a student, has created a comic strip to explain her life with autism. See article. Everyday Aspergers is a Facebook community group that features posts of a supportive nature. The author’s pen name is Sam Croft and her mission is, To raise awareness about Aspergers and females. It is linked to a personal blog of the same name. Mothers of adolescents and adults with autism experience chronic stress comparable to combat soldiers and struggle with frequent fatigue and work interruptions …, according to an article about a study by Marsha Mailick Seltzer, a university researcher. See article for more about this. Here is a very readable blog post under the heading of Life with Asperger’s. He says, The incidents were blown out of proportion by the tactics of the police and the social difficulties experienced by the aspie. An autism mum has written in detail how she experiences her son’s meltdowns and what she thinks may be worth considering in order to help. See The truth about my child’s meltdowns. To find out how this came to happen, see: April. Here is a feel-good story, with pictures, about a teenage boy offered a life changing opportunity by a police chief in America. This young lady says, “I never knew anything was ‘wrong’ with my brother until I started school. People treated him differently and then started treating me differently.” Have a look at What my autistic brother has taught me and see how things developed. Here is an article about a mother’s closeness to her son, who is on the autistic spectrum. The title is When I Hear What My Son With Autism Doesn’t Say – though he is completely verbal. The Experience Project offers personal stories from many walks of life. For example: ‘Life is hard enough with a family and children, but to have one that has special needs changes your life completely.’ To read more, click on Debra. Here is a blog called Mother Autism, written by one particular autism mum. She gives it the subtitle, Livin’ the dream & livin’ on the edge. 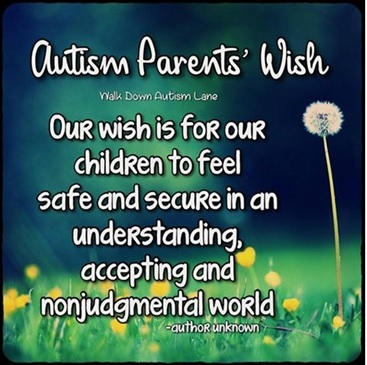 Another autism mum keeps a personal blog called All the words. Nine-year old non-speaking boy write bestseller book about autism for educators, parents and students. Click icon for article and Amazon for book.